If you’re super keen you can view the live webcast. It’s likely to be a fairly mundane event although with any political process there’s the potential for fireworks. Ageplay, gambling and financial services are obvious areas but we’ll have to wait and see how wide the focus becomes. Update: a text summary of the hearing can be found here on Virtually Blind. 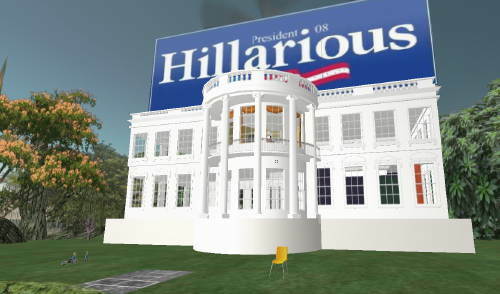 We reported recently on some excellent political satire occurring in Second Life focused on Hilary Clinton. Republican Mike Huckabee gets his turn with the opening of the “The Mike Huckabee Center for the Liberation and Housing of Spermatazoan-Americans”. Built by “Gen.JC Christian”, his blog gives a pictorial tour and an explanation of the build. The growing attention on the US Presidential Election is only going to ensure that virtual world satire goes from strength to strength. Once each party has their candidate I’m expecting some even more cutting 3D commentary. 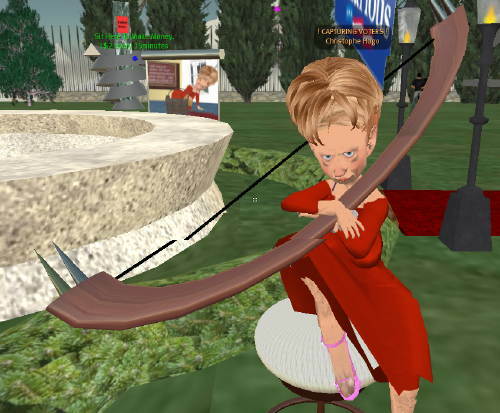 Does Second Life need a Republic? 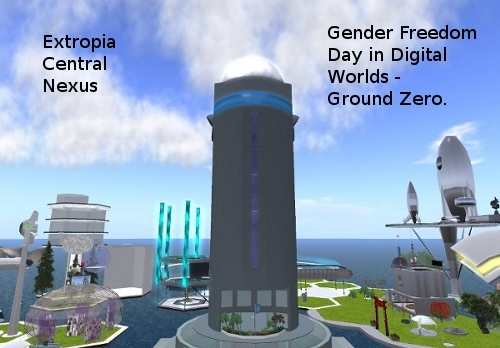 “The Metaverse Republic, currently work in progress, will be a legal system for Second Life, with real powers of enforcement originating in user-created tools, and a democratic parliament. That’s one hell of a brief and it’s not an initiative likely to receive widespread support for two reason. First, there’ll be automatic scepticism toward one model of goverment put forward by one group. Secondly, apathy rules – a resounding majority of people in the real world find politics a boring, meaningless pastime with no direct relevance to their daily lives. This is unlikely to be any different in the virtual world context – our own reader survey conducted last year showed just that, a real lack of interest in the politics stories we run. That said, such an experiment doesn’t deserve outright condemnation – at the very least it should be considered a useful experiment. The Virtually Blind blog has an interesting discussion underway on the whole concept. 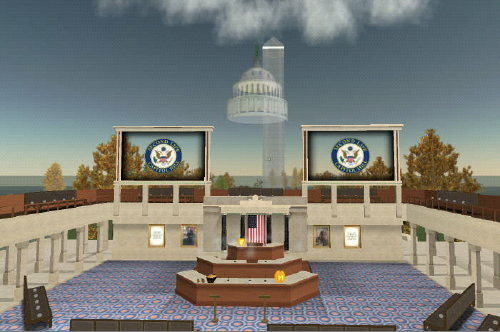 What do you think – does Second Life need a government? 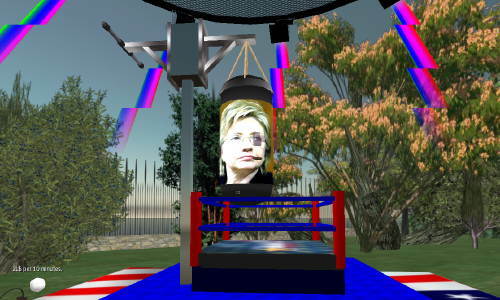 With ten months still to go until the US Presidential election, Second Life is definitely hotting up as a platform for campaigning. As you’d expect, where there’s political activity there are satirists waiting in the wings to lighten the load for those of use bombarded by the whole election process. Christophe Hugo is one such person. He was too busy for an extensive interview but I did manage to ask whether Christophe’s efforts were coming from a particular political ideology. His response: “I am a French Marxist (of the Groucho Marx movement)”. Thanks to New World Notes for the heads-up. Gamepolitics.com has covered a march undertaken by 200 or so avatars in World of Warcraft to support US Presidential election candidate Ron Paul, who’s on the Republican side of the fence. Second Life is a regular venue for political discourse but it’s fair to say World of Warcraft isn’t a natural fit as there’s no ability to create individual content to augment political activism. That hasn’t stopped people from making their views clear via this march and it’ll be fascinating to see if there’s growth of such events in WoW in the lead up to November’s elections. What’s stopping some PvP events occurring along political lines? Election campaigns can be brutal on both the combatants and the electorate so this would be an obvious next step. ABC Island played host to an election night party, with lots of chat about unfolding events in the real world. The ‘Australians’ group in SL was also buzzing with a running commentary. Numerous comments were expressed in regard to the ALP’s broadband policy and its impacts on the SL experience. There was plain old partying. As one party-goer said, “I just wanted to be with some Aussies at this historical moment”. 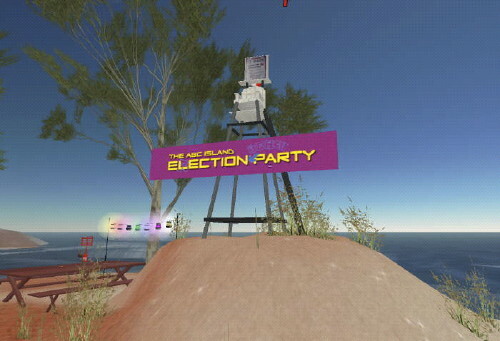 There’s been no involvement by Australian political parties in Second Life to date – my prediction is that by next election there’ll be a marked presence by at least one party in the virtual world sphere. F.I.R.E. – Second Life’s first native political party? Last week I noticed a press release from Second Life political party, F.I.R.E. (it stands for Freedom, Improvement, Respect and Enjoyment). They’ve surveyed SL residents on their perceptions and clim to have a future agenda on a number of issues (see full press release below). There’s understandably some scepticism and confusion around F.I.R.E.’s aims, particularly in an environment with no governmental structures, but at the very least it will provide an alternative to the RL politicians setting up presences without significant engagement with the SL community. As far as F.I.R.E. being the first political party, I’m aware there have been many lobby groups and even some sim-based ‘governments’, but I’d still argue this is the first SL-wide formal party. It may be perceived by some as a loopy party for its insistence on not adopting a set ideology, but a party it still is. What are your thoughts – can you see a grass-roots political party with a very broad ideology working in SL? “October 31, 2007. SL POLITICS ON F.I.R.E. Recent studies conducted by Second Life’s first political party – F.I.R.E. – reveal that SL is lacking in the areas of freedom and respect. On the plus side, research also indicates that SL is improving fast enough and that there is a sufficient amount of ‘fun’ here in the virtual world. 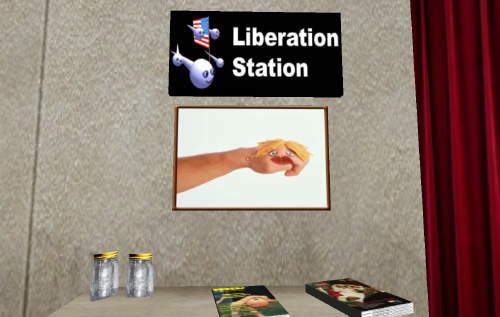 Recent studies conducted by Second Life’s first political party – F.I.R.E. – reveal that SL is lacking in the areas of freedom and respect. On the plus side, research also indicates that SL is improving fast enough and that there is a sufficient amount of ‘fun’ here in the virtual world. F.I.R.E. believes that sacraficing “freedom & respect” in favor of “improvement & enjoyment” will not benefit SL and needs to be halted immediately. F.I.R.E. represents virtual interests. F.I.R.E. is an independent SL-based political party for the promotion and protection of Freedom, Improvement, Respect & Enjoyment. Since early May 2007 F.I.R.E. has been getting organized. We are currently developing the party platform. On the agenda for the coming months are issues such as “cyberwar draft”, “powershifts”, “100 dollar laptops” and “squatting rights in SL”. More on the research F.I.R.E. conducted. * Note on Freedom: High costs of SLiving and the prohibition of gambling are seen as the main problems with freedom. ** Note on Improvement: Most people named themselves and others as the main providers of improvement. Linden Lab came in at second. This survey will be repeated in 2008. Gambling should not have been banned. If things were really getting out of hand, then gambling should have been brought under control and not simply banned. Banning is a sign of weakness and benefits nobody. Under certain improved conditions gambling should once again be enjoyed legally. Update: SLNN have an interview with Datus Clary. In June this year, I wrote a piece for Crikey.com.au on the lack of interest by Australian political parties in Second Life as a campaigning platform. I even contacted the offices of the Minister and Shadow Minister for Communications asking them for their thoughts on Second Life – with absolutely no response. 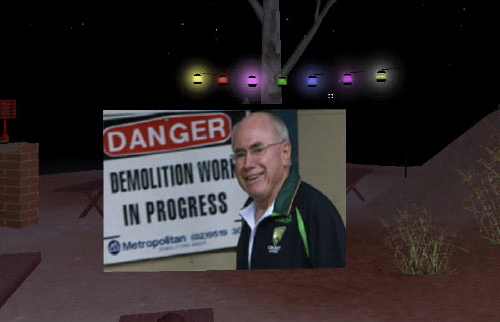 Now that the 2007 Federal Election is underway, it’s fairly safe to assume there’s not going to be any official campaigning in Second Life and it also doesn’t look likely that any grassroots efforts are underway. Given the heavy presence of US presidential hopefuls in SL, was I being naive in assuming there would at least be some activity from an Australian perspective? I fully understand that with a lot less than 15000 active Aussie SL users, there’s not a lot of political gain in terms of votes gained – but surely there’s some awareness of the value of being perceived as innovative. The first Australian political party who sets up in SL is pretty much guaranteed widespread, mainstream media coverage. I’d also be interested in hearing suggestions of how political parties could actually be of use in SL, if at all. I intend on bundling up the suggestions and emailing them to each of the parties for comment. As mentioned previously, Hillary Clinton has a campaign presence in SL. 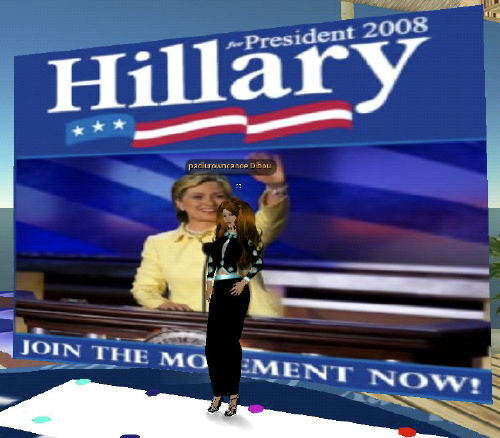 We took the opportunity to catch up with chairperson of the Hillary 2008 Group in Second Life, Padlurowncanoe Dibou. She’s an educational technology director, Democrat member and mother or three. She’s also very passionate about the benefits of Second Life for promoting policy debate. Lowell: Can you outline how you got involved in the Hillary campaign? PD: I visited the former Hillary HQ and began my initial participation there. Lowell: I’m assuming you’re a member of the Democrats? Lowell: May I ask where in the US you are located in real life (RL)? PD: I am from Arkansas, home of the Clintons for many years. Arkansas is Bill’s home state and he was governor of Arkansas for many years. Lowell: Is this build an official part of the RL campaign? PD: As for being the chair (of the virtual HQ), it is something that evolved. I was asked by other members to do so. I am not a RL politico — my interest is not associated with any political career aspirations. Lowell: Why did you choose Hillary’s campaign rather than one of the other potential candidates? The Arkansas connection? PD: I am here because I passionately believe that Senator Clinton is the best person to lead the United States both nationally and internationally. Lowell: What are the main advantages Sen Clinton has over the other Democrat runners such as Obama and Edwards? PD: Senator Clinton is the only candidate that has the wherewithall to put together a top notch team of people and she has the international trust and support to lead us away from where the Bush administration has put us. Lowell: In regard to this virtual HQ – were you part of the team that built the preview stage and how has the response been since it opened? PD: Let me back up for a minute to answer that question. My first approach here is to serve the Hillary supporters here in SL. My primary purpose is them — not to be regurgitation of what they would find in RL. This is a unique opportunity to take political participation and discourse in a new direction. You, as a blogger, are part of that new direction. After the debates, the major news networks immediately look to see what the bloggers are saying. This is the next dimension to that. Lowell: So in that respect has this HQ attracted lots of interest from SL residents and the wider community? 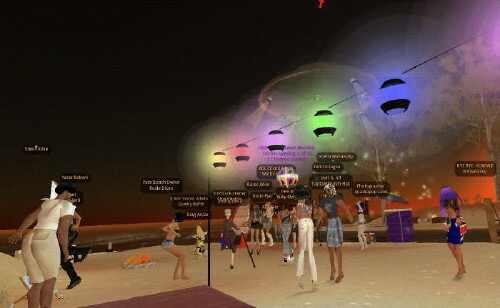 PD: Our last event on the 4th of July — “You and I — 24 Hours of Freedom in SL” was attended by hundreds of SL residents. In RL and SL, we are dealing with a new phenomenon — people using technology to play, to communicate, receive news, etc — and it is becoming more interactive and accessible all the time. Lowell: Who is funding this HQ? It’s a great sized parcel / sim which isn’t cheap. PD: It is run by the Hillary group’s steering committee. To give you an example, the photos, letters, and Fed Ex costs to contact the RL campaign came from my pocket. Lowell: Ok – so to clarify, the steering committee doesn’t currently have a formal connection to the RL campaign team but you are hoping it will be endorsed? PD: My first priority is to serve the SL Hillary supporters, the second is to put together and host events where important issues facing the United States are respectfully discussed, and the third is to build a bridge between the SL Hillary supporters and the RL campaign. I feel that if priority one and two are met, then the third will come. Lowell: So the bridge building you’d hope would eventually lead to a formal endorsement of SL-based campaigning? PD: Yes, that would give us support and an opportunity to raise funds in support of the Senator. This is a unique place. One of the best parts of SL is the response from the international community here. They are very supportive of the Clintons in general and are very vocal about their support of Hillary. Lowell: Are you ever in touch with anyone on the RL campaign team? PD: Yes, I keep them updated on our progress here in SL. Lowell: The interest in political campaigning presences like this is whether candidates have the remotest interest in SL and how transparent the campaigns are. Hence my questions on linkages as I know some people are very wary of SL builds proclaiming to stand for a candidate yet avoid disclosing any link to the RL teams. Lowell: So you believe candidates themselves believe it’s a valid campaigning tool? PD: Yes, but you have to put into perspective how rapidly SL has grown. I came in-world in November, and the growth and interest in it has been truly amazing. But in some ways, it is the Wild West. Regulations, legal matters, etc. have a difficult time keeping abreast of emerging technologies. SL is providing an opportunity and a voice to the people — sometimes people who don’t feel they have one in RL. It is also giving us an opportunity to evolve the old way of doing things. Lowell: In regard to the array of policies and speeches etc you have here – do you get people utilising the opportunity to look at the details of Sen Clinton’s positions on things? PD: First, take the Hillary HQ. Our vision is for it to be a fun place for supporters and interested people to come. We know that students learn better when it is fun — and I think the same holds for us adults. I have had many interesting political discussions here sitting on these couches, as the waves, roll in, and great music plays in the back ground. We held a universal health care discussion here with a panel of health care professionals and a moderator. The audience was asked to submit their thoughts and ideas to be compiled and shared with the RL campaign. Before and after, there were stories and ideas shared among SL residents. Afterwards, we enjoyed the music of a live entertainer here in SL. We make it fun — a time to make friends, learn, share, dance — and certainly there are those that may criticise our approach, thinking SL political events should be more like RL political events. But our recent turnout suggests otherwise. Lowell: When the Democratic primaries have been completed and there’s a presidential candidate, do you think the other presences will throw their weight behind the successful person? PD: I can’t speak for others, but as I told the Obama SL campaign, we should be friends as one day we will be working together. I intend to. There are more unifying factors amongst US Democrats than differences. I will be happy to take that agenda forward. Lowell: If you had unlimited resources, what sort of campaign presence would you build in Second Life? PD: Obviously, it would be helpful to have someone be able to devote themselves full time to the SL Hillary efforts. I, and others, must balance full time careers and families with our efforts here. As you can imagine, putting on a 24 hour event takes a great deal of planning and implementation — in addition to attending the event. Lowell: Why do you think there are more Democrat candidate presences than Republican ones? PD: US Democrats are progessive people. I think they have vision and are forward looking. 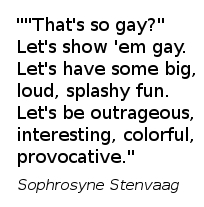 That is certainly a description that applies to people that embrace SL’s possibilities. By the year 2010, 80% of websites will be in a virtual world. Lowell: Have you had issues with griefing in a significant way and if so do you believe it’s come from your political opponents? PD: No, griefing has not been a problem at our events. Lowell: Do you think those sort of things could be an issue as the real campign gets underway next year? PD: Certainly, once a democratic candidate is chosen, it raises the stakes and interest in that candidate to a whole new level. But with good management by people who are SL savvy, I don’t think it will be problematic. PD: I think the chances of some kind of appearance would be good. There are a lot of ways to do that — just as the 7.7.07 concerts were brought to SL live today or how the MacArthur event was managed. All very successful, all very safe.